There are instructions on the jar, but we feature a method below that creates a brilliant Pad Thai using this sauce. Just opening the wide-mouth lid gives a wonderful tamarind-ishly sour, sweet salty aroma. As with all Mae Pranom sauces, this is packed in a nice thick glass bottle, and they sensibly made the opening nice and wide because the sauce is thick. For fun we put some of this sauce in a dish, added a bit of water to thin it out, then poured that over regular spaghetti noodles--for a nice result. Ingredients: sugar, tamarind, seasoning sauce, salt. No preservatives. There appeared to be a general consensus that (a) your Mae Pranom Brand Pad Thai Sauce is the best anywhere (even better than when I make it from dried tamarind -- and a LOT easier) and (b) the outdoor show-and-tell with the Thai Gas Burner & Wok Stand on the patio a great combination. Those who were familiar with Pad Thai thought the noodles were great, and those who were previously unfamiliar now know that Pad Thai is very good. Many customers like Mae Ploy brand because it has a more complex flavor, with a combination of sweet, sour, hot and salty. After watching the video, note how simple it looks to prepare Pad Thai in this style. The only "mystery" is how to prepare and flavor your noodles, and we've solved that for you here. Note the pictures below. First, grab a small handful of rice stick noodles and place them in a pot. Pour some boiling water over the noodles (enough to cover them), and let those sit for exactly 10 minutes. While the noodles are soaking, mix two tablespoons of Pad Thai sauce with two tablespoons of water in a small dish. Separately, slice some Chinese chives, or green onion, and set aside. Pound some peanuts in a mortar & pestle, and set aside. After your noodles have soaked for 10 minutes, drain the water out by tilting the pot, and holding the noodles in with a slotted spoon--just don't drain *all* of the water, leave a tiny bit in the pot. Now place the pot of wet noodles over medium/high heat, and pour your pad Thai sauce mix over the noodles. Let them cook for two minutes, stirring well. Add one more teaspoon of pad Thai sauce in the process. Remove from heat, and let these fragrant golden noodles set while you prepare the rest. In a skillet over medium/high heat, add about 2 teaspoons vegetable oil. Add one egg, and spread the egg around a bit (as shown). Let this egg cook, at least a minute or two. Don't add the bean sprouts until your egg has a chance to cook and set up. Next, add some sliced greens (spring onion or Chinese chives), and some fresh bean sprouts to your egg. Plus tofu if you like. Then add your cooked noodles, a bit of salted radish, a dash of sugar, dried shrimp (optional) and the crushed peanuts. Flip the egg (as shown in video) and mix it all around on the skillet, and remove to a serving dish after a short time. Add lime juice. This is absolutely delicious. Enjoy! Add lime juice, serve and enjoy! 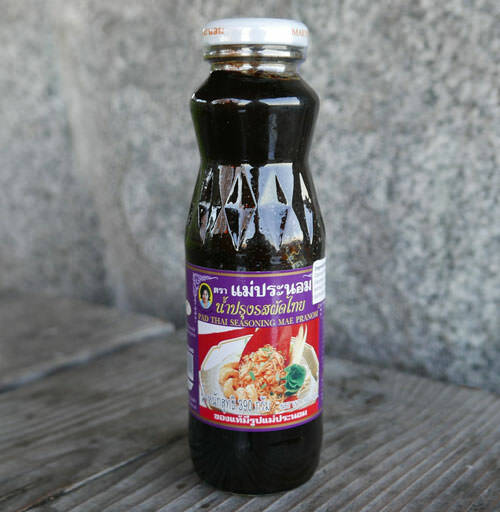 This is our "legacy" brand of Pad Thai Sauce, which we first started offering in 1999 when it was difficult to find such a sauce. It's packed in a large 33 oz plastic bottle. Flavor is mild, and not as authentic or fresh as the Mae Pranom. Ingredients: water, peanut, onion, garlic, sugar, salt, vinegar, hydrolyzed vegetable protein, tartaric acid (E334), sodium metabisulphite as preservative (E223).. Product of Thailand.